A few weeks ago we learned that a house we had been interested in was sold. We had first seen the house last fall and wrote about it here, and then did some research because the realtor who showed it to us couldn’t answer our questions about the structure and the land. Obviously, other people looking to buy were less apprehensive about the property. Another reason we hesitated for so long was the price. When we first inspected the house we thought ¥15 million was reasonable considering the size, the layout, and the unobstructed view to the south, but then we noticed that in the same general vicinity a developer was selling brand new houses of a comparable size for only ¥16 million, and some were even closer to the train station. Looking at these houses on the web we realized that the reason they were so cheap was because the developer had bought a tract of land in an undeveloped corner of town and just filled it with as many structures as it could. These were not houses ordered by people who first chose a plot and then a model from a list of designs to build on the plot. The developer divided up the tract and went ahead and constructed identical houses on all of the plots, with perhaps minor differences determined by light exposure or shape of the land. By doing it in a mass way, the developer could save money. Though we could tell by just looking at the photos on the web they were not for us, we also thought it would appeal to a lot of potential buyers simply because the houses were brand new, and thus it would be much more difficult for the realtor selling the house we’d been interested in to unload it, but we were wrong. 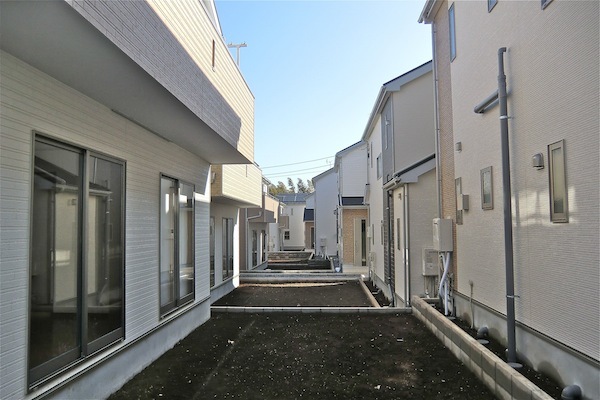 The existence of such new homes made ¥15 million seem like a lot for the house we had been interested in, so we did a search and found several developments in northern Chiba where brand new homes were being sold at prices below what we had come to think was the average for used homes. Two were in Shiroi on the Hokuso Line, each about 15-20 minutes from the nearest station. 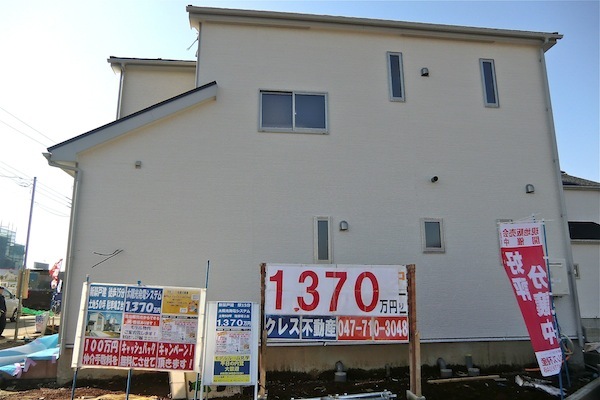 In one development they were going for as low as ¥13.7 million and the other as low as ¥14.8 million, which is dirt cheap considering that new homes in the same area with the same floor space and land area, and probably less in terms of fixtures and amenities, were likely going for ¥30-40 in the early 1990s. Of course, comparing anything real estate-wise to the late 80s/early 90s in Japan is a chump’s game, but it does provide a perspective that’s instructive when it comes to making priorities. Ours weren’t significantly altered when we took a ride to see these two developments. The first was fairly large and had construction begun only on a small portion, but it was proceeding quickly. Predictably, the houses were positioned very close together and little if no attention was being paid to orientation. Since the structures were all of the same general design, the sides that were supposed to face “north” invariably contained all the mizu-mawari functions, such as the kitchen and bathroom, and very few windows, which were all frosted or pebbled. It didn’t matter if the north had some sort of clear vista and the south was right up against the neighbor’s north (thus shutting out some of the precious sunlight that provide the reason for having southern exposures in the first place). None of the houses were open for inspection yet, so we could only judge the quality from the exterior: uniform beige siding in a variety of styles, from fake-looking brick to fake-looking mortar to fake-looking shingle. In once house we looked at the caulking between the siding panels already seemed to be loose and protruding. 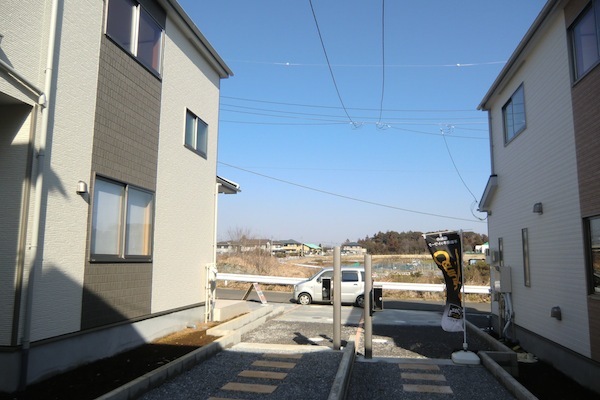 The other development was on the other side of the tracks and because it was more convenient in relation to the station the houses were on average about a million yen more. These were even more tightly packed, but since there were only three rows and to the south was a pear orchard and to the north a rice field, if you didn’t buy a house in the cramped middle row you’d get some relief from having to stare at your neighbors’ walls all day. That said, the pear orchard was separated from the development by netting on which the owner had affixed signs stating that agricultural chemicals were used in the cultivation of the fruit, and that there would be “strange smells” and “noise.” It was certainly nice of the orchard owner to provide this information for potential buyers, though we suspect the real reason is that the owner disapproved of the development in the first place. We’re sure there’s a long and much more interesting story behind the signs, but in any event most of the houses were already sold, so agrichemicals be damned! (This reminded us of when we lived in Kawasaki near a house with a small vegetable garden that had a sign for potential tomato thiefs: “Pesticides used: May be dangerous to eat”) There were no salesmen around so we couldn’t see inside. We had called one of the related realtors beforehand who offered to show us one of only two houses still available but all we wanted was the address. (As it turns out, this development wasn’t the one we intended to see, meaning that there was another cheapo housing development not far away. These things are springing up like mushrooms after the rain) Maybe because the development was farther along it looked more presentable–slate paths between the houses, some rudimentary landscaping–but the houses were just as cheap-looking as the ones we’d seen earlier. The only difference was that the windows were a little bigger. A week later we rode over to Usui, in Sakura, not far from where that house we were interested in was located. In an area called Usiudai, on the top of a hill, was another new development with half a dozen cheap new houses. This particular area was already developed, and the neighborhood had a pleasing ramshackle atmosphere characterized by older plots of small farmland and patches of forest and vegetation. The development had been carved out of a sliver of land that lined one road, so all six houses were positioned in a row along the road, north-to-south. When we arrived there was no one there, though we had been given to believe three of the houses were open for inspection. In any case there were no other lookers, and then we discovered the salesperson sitting in her car in one of the driveways, apparently to get out of the cold. She emerged when she realized why we were there and seemed half-grateful-half-put-out, as if relieved she had something to show for a day’s work (even if it was only the questionnaire we filled out) but irked that we took her away from her novel. ¥15 million, that is cheap. How many tsubo of house and land do you get for that? You mean the house we *were* interested in? The land was 123 sq. meters (including part of a private road) and the floor area of the house was a little more than 100. I’m an only an occasional reader and was kind of hoping you’d decide on the something-to-think-about house. It looked like it ticked a lot of boxes for you. I’m not sure if new cheaply built new houses are a bargain, but I think well-built and well designed s/h ones are. I think an increasing number of Japanese people are discovering this too, so the “lose half the build cost in ten years” rule may not apply to every house out there as it may once have done. Anyway, good luck with your search and keep reporting! Is there also a japanese version of texts??? This site is only in English, if that’s what you mean. Thanks for the information. Do you find real estate agents in English or Japanese? Thanks. Who was the builder of these homes? These days most home builders offer third-party warranties, don’t they? In order to get those they have to have third-party inspections during the building process. And these inspections result in pretty detailed reports, including numerical 1-to-3 ratings for things like fire resistance and earthquake resistance (which are used in determining casualty insurance rates, with the insurance company being yet another third party). It takes quite a huge conspiracy these days for all parties to be in collusion to rip you off. As for “kit” homes, these are simply homes where the lumber is cut off site. Even a custom home has its lumber cut off site. You can’t bring the machinery to do it to the site. Nobody’s building homes with hand saws and wood chisels these days. Even for “reform” of older homes the lumber is cut off site. For things like a genkan reform for a Japanese style home, the entire unit is built off site and trucked in, even for a custom remodeling of a custom home. There is no reason why cutting lumber off site will compromise the quality of the home. You had a comment the other day from a fellow with construction experience who observed that the foundations and framing of Japanese homes he’s seem built recently seem solid. The problems you observed were cosmetic. When you make an offer on a home the agent writes up all your beefs (and request for a lower price), and makes it part of the offer, and anything accepted it will be in the contract. The builder will send people in to fix the problems. Since you have apparently spent a couple of decades looking for a home but never made an offer on one, perhaps you aren’t aware of this. Things that are asked for include: installations of window screens and closet poles, repair of wallpaper seams, installation of exterior electrical sockets, landscaping and earthfill, and so on. If you don’t like pebble pair glass, you can ask for it to be changed to transparent, or just have it done yourself after the purchase. I think you are stuck in a broken-record mode of endlessly repeating cliches about Japanese housing. To build a basic small home in Japan (an LDK and three rooms) costs only about 7 million yen these days for larger operations. So if you can get the land for cheap, yes, they can sell a home for 15 million. The more expensive the land is (closeness to station, to Tokyo, size), the more the home will cost. The more expensive the materials are, the more it will cost. The fewer the number of homes in a development, the more it will cost, since the geologicals and grading and inspections and utility infrastructure and the like will be divided up among fewer lots. Also, I think you’ve been away from the U.S. too long. I seen recent construction homes on both coasts and in the Midwest. They are very basic, and they tend to be built to a template of what is popular at the moment. Don’t want a “great room” because you cook a lot and don’t want the living room stunk up? Tough, you’re getting a great room, like it or not. These houses are easier to sell new and have better resale value for a longer period of time. Likewise, in Japan they build what is currently popular. Peter, so I guess in many ways you’re confirming much of what we’ve read on this blog before. 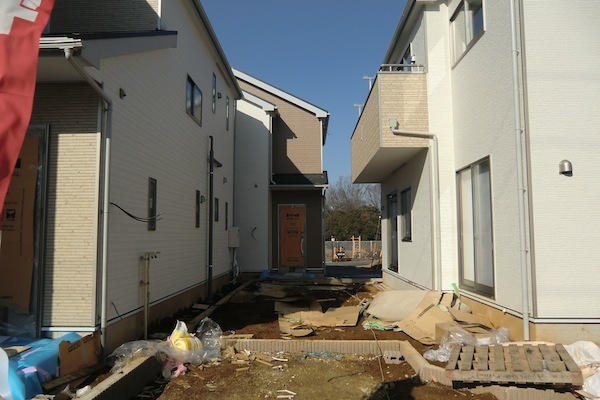 That is, many new homes in Japan are built to a tight budget and, while they might be structurally sound, cosmetically they are rather generic and sometimes have pronlems that need fixing. As I understood it, one of the main points made in the original blog (but which you did not address) was that, while “[o]n the surface, these houses looked fine, … you could guess that within five or ten years they’d look as cheap as they were.” My own experiences of looking at second-hand homes in Japan resembles that of the bloggers. So many houses less than 20 years old (which is not “old” where I come from) were structurally fine but cosmetically terrible. While some of this was due to poor maintenance, the cheap quality of the original construction virtually guaranteed that the house would not stand the test of time. Thank you for your blog. I have been in the process of passively looking at property in Japan for a few years and really appreciate it. Poor quality of the Japanese housing stock is a truth self evident. i don’t feel your blog is a broken record at all given this. And i think one day you will get luck and find the perfect property. 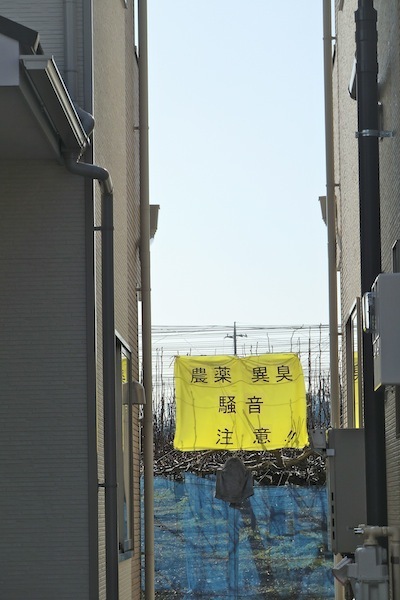 If you work for the Japanese construction industry or realty business, it is perhaps only fair in the interests of transparency to declare your interests.